Unveiled at CES this week, the new MakerBot Replicator series includes three new models designed to offer easy and accessible 3D printing. 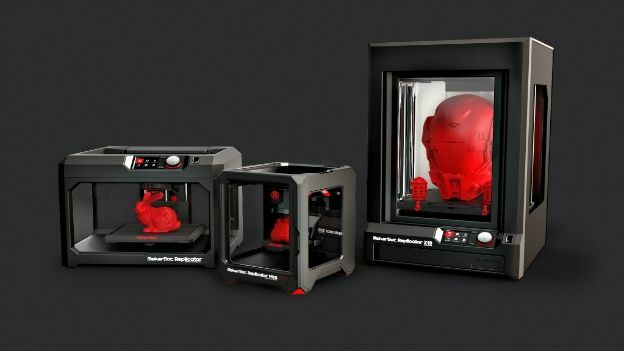 Developed by Dynamism Europe Ltd and revealed at CES which came to an end yesterday– MakerBot's 5th Generation Replicator series is the company's latest effort to bring 3D printing to the masses. The signature MakerBot Replicator shows off a sleek, industrial design capable of printing a remarkable 100 µm print resolution. It has increased build volume by 11% and now features a 3.5" inch LCD which shows previews of 3D models including an integrated camera that allows you to take photos and share them on Facebook and Twitter. The Replicator also features USB and WiFi connectivity so you can connect it to your network or print directly from USB connection or drive. The MakerBot Mini is a small compact model that is all about simplicity, ideal for students, teachers and the workplace. Features include a simple one-touch 3D printing, an enclosed build platform that does not require any leveling, PLA-based printing with WiFi connectivity. The last in the 3D line up is the Z18, an industrial-sized printer that's designed for professional use. This powerful printer offers massive build volume and ability well beyond anything else in its price range. It prints objects up to 12 x 12 x 18 inches in an enclosed and heated chamber ensuring the quality and stability of even the largest 3-D designs. Similar to the Replicator, there's USB and WiFi connectivity, an integrated camera and a 3.5" inch LCD which shows previews of 3D models. All three versions of the new MakerBot series feature the new Smart extruder which automatically detects when it is out of filament and pauses your print. Whilst the 5th Generation MakerBot Replicator is available to purchase and ship now, the Mini and the Z18 units are available on request / first come first served basis. The entire series are available for order/request at the Dynamism website.